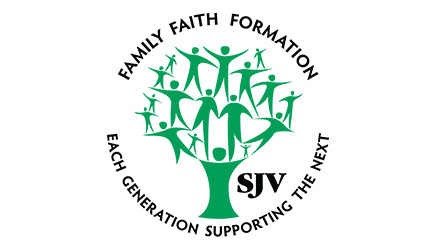 All SJV Formation Families; School Families also welcome! The purpose of the Family Faith Formation program is to enhance the religious and moral development of your children by supporting you, their parents, with professional speakers, parental peers, and family activities. Each session begins with prayer and a shared meal—breakfast on Sundays and dinner on Mondays. Following the meal, children and youth attend age-appropriate formation sessions with their peers. Parents hear a presentation from a speaker and participate in small group discussions. The session topics are about aspects of our faith and how to effectively share them with your children.